The project aims to install a nanotechnology water filtration system at each of five school identified in Mphumalanga. These sites were selected as they rely entirely on borehole water in summer. In winter the borehole water sometimes runs dry. The five schools selected, represent areas at risk of water-borne diseases and will be used as case studies for the the NRF Flagship. The filtration system provides water into a completely new storage tank.The treated water will be free of heavy metal contamination, viruses, bacteria and organic pollutants. It should be completely safe to drink and wash hands with. Tanks and filtration material will be designed to function autonomously and if needs be, solar powered systems may be developed to insure that electricity is not required to power the fitration process. Prof Mhlanga plans plan to demonstrate a system that can be commercialised within the NRF flagship project. To do that Mhlanga has called on international experts in developing nanotechnology for water purification and commercialisation of such systems in developing countries. Professor Arne Verliefde from Ghent University will form part of the multi institutional team. Prof Verliefde brings with him, expertise in both the biosciences and engineering. Four of his Masters students will travel to UJ on an exchange basis until May 2014. Prof Verliefde will be traveling to SA a few times during the project. In addition Prof Mhlanga has also engaged Professor Thalappil Pradeep, who is a professor of Chemistry from the Indian Institute of Technology in Madras. Prof Pradeep will be taking up a chair in Nanotechnology and Water Research and has expertise is in developing nanotechnology filtration systems for areas affected by heavy metal pollution. He has a company mass-producing these systems. Local researchers on the project include Prof Titus Msagati, Prof Catherine Ngila and Dr Edward Nxumalo. 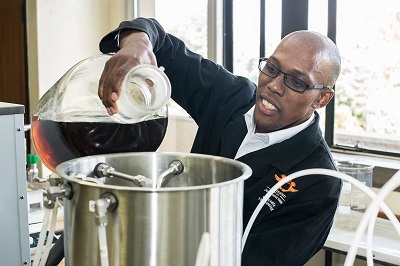 Prof Msagati and Prof Ngila from the Department of Applied Chemistry at UJ will carry out the water characterisations and method development of the nanotechnology filtration materials. Dr Edward Nxumalo will work on the composition of the materials in the nanofilter. Other collaborators on the project the DST/Mintek Nanotechnology Innovation Centre -Water Research Platform and the newly established Institute for Nanotechnology and Water Research established at UJ.